Britt Hovde Ross and Elisabeth Steen, two Norwegian expatriates living in New York, collaborated on Kristiansand New York after meeting each other at a SoHo store opening. Both were fragrance enthusiasts, and Steen had experience in fragrance and cosmetics marketing. The two women decided to create a men’s scent, and approached Drom Fragrances. Drom perfumer Pierre-Constantin Gueros, who also created watch company Nooka’s recent fragrance (reviewed by Barney here), was asked to create a scent for men that embodied both Norwegian coastal beauty and New York sophistication. The scent is named for Ross’s home town, Kristiansand, which is on the southern coast of Norway. Does Kristiansand New York smell anything like urban sophistication and Scandinavian nature? I don’t know. As easy as it is to write about this inspirational imagery, it doesn’t really tell us anything about the scent. That said, I was predisposed by my Norwegian ancestry and New York residence to like this fragrance. Imagine my surprise when, upon first scent, I did not. I tested it on a tissue, spraying it liberally. The top notes were strangely indistinct, with no single note dominating. It was a muddled, generic scent, something that just smelled “safe.” I went back to it after it dried down and was still unimpressed. Some critics compare it to Dolce & Gabbana Pour Homme, another woody fragrance with mandarin top notes. Why, I thought to myself, would an upstart fragrance be so bland? Wouldn’t you want to stand out? The next morning I decided to give it a fair chance and sprayed it on my skin. Good thing I did. The top notes—which the company describes as “crisp greens, mandarin and exotic spices”—were still muddy to me, but the dry down, which started after about 15 minutes, is quite nice. The fragrance becomes a warm, slightly woody, slightly powdery amber. And it has staying power. Although the bottle says “eau de cologne,” Kristiansand’s publicist tells me that it’s a 15% concentration, making it closer to an eau de parfum (typically 15-20% oil concentration). I like this fragrance, and I’m not sure what it was that turned me off initially. It’s worth the wait for the smooth, masculine basenotes. 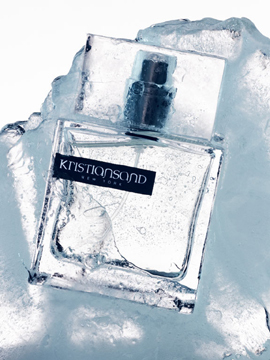 Kristiansand New York ($65 for 50 ml) is sold in stores across Norway (including the town of Kristiansand, of course), in New York City’s Cry Wolf and at Beverly Hills Perfumery in California. Buy online at www.kristiansandnewyork.com. This entry was posted in Fragrance Review and tagged Britt Hovde, Dolce & Gabana, Drom Fragrances, Elisabeth Steen, Men's Colgone, Men's Fragrances, Men's grooming, Men's Scents, Nooka. Bookmark the permalink. This is by far my favorite men’s cologne. The scent is just extremely appealing to me and doesn’t smell like anything else out there. I got it for my boyfriend asap as soon as I found out the name of it. Kristiansand is definitely at the top of the list for me.